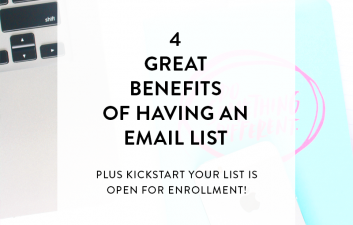 It’s no surprise by now that I totally think that (in most cases) you should have an email list. It’s a super great way to connect with your audience and start leveling up your brand, and what better time to start than right before the new year? The problem, though, is where the heck do you start? There are a ton of different email marketing platforms (EMP) at different price points and with different features. When I started my email list nearly three years ago (wow, it’s been a long time!) I decided to start with MailChimp, and I’m a firm believer that this is the best EMP for anyone just getting started and on a low budget! 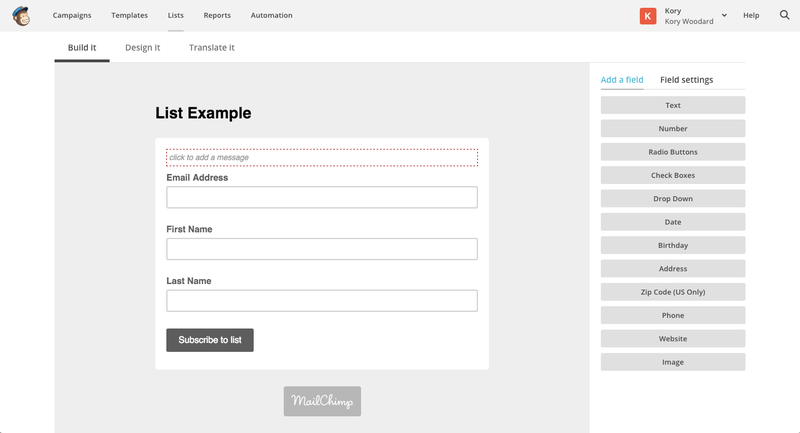 Yes, I realize that ConvertKit and other platforms are out there and getting more popular; however, MailChimp has the most features for their totally free option! It’s also one of the best platforms because, unlike the newer options, it integrates with nearly everything online. This means smooth sailing when trying to set up your first course on Teachable, sign people up for your list after completing payments with PayPal, or anything else you might be trying to do! 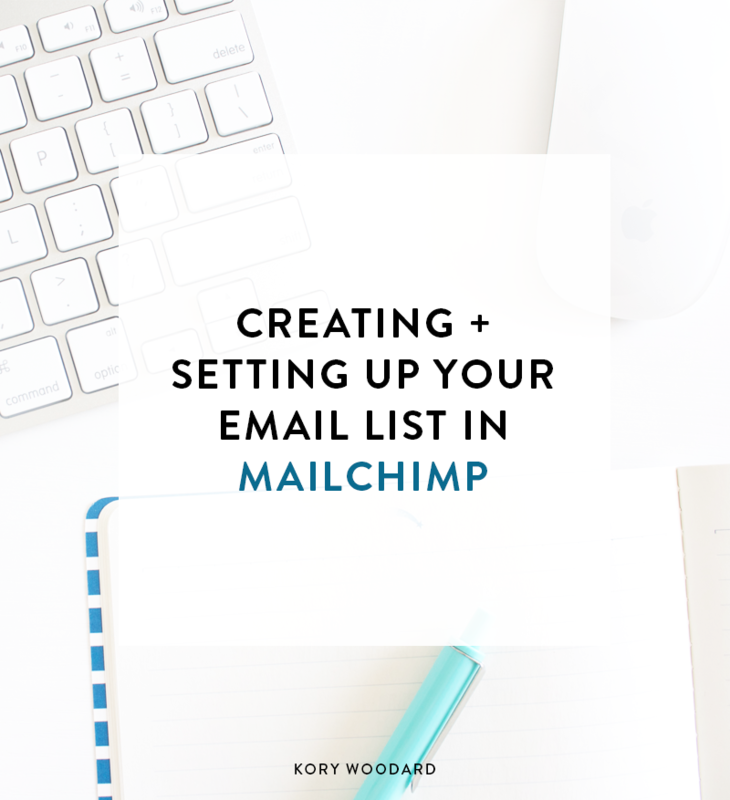 Getting started with MailChimp is a little confusing, though, so I wanted to share a detailed tutorial on creating and setting up your email list in the platform! Obviously to use MailChimp you’re going to have to create an account if you don’t already! You can see in the image above the three different pages you’re going to see when you’re setting up your account. First, the sign-up page where you select a username and password. Next up is the page where you have to put in your information. It’s required by law that you include a physical address in your emails, so you absolutely must include a real address here. 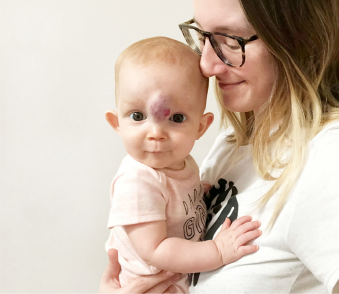 If you’d like to learn a little more about this, Fran wrote a really great post on why you have to include your address. The final page you’ll see is the dashboard, which is what you’ll see every single time you log in! This part is pretty straight forward. On the dashboard, you’ll see the second option listed is to create a list (if you don’t already have one). Once you click the correlated button, you’ll be taken to a page that either a) has all of your email lists or b) says you have no lists and points to the button to create one. After you click that button, you’ll be asked to put information in about your list to move forward. The details here are important because it’s what people will see when they sign up (or unsubscribe) and receive emails from you. You’ll want to name your list something that will help you know what it is in case you start creating new lists in the future. You also want to go on ahead and put your name or business name and your public email address so people know who the email is coming from. Finally, it’s important to let people know where they signed up or why they’re receiving emails, and of course as I mentioned before you must include a physical mailing address. It’s not necessary to have your actual home address, in fact, I recommend that you go and get a PO Box so you can use the address to it instead. Of course to get people on your list, you have to have a sign-up form available. The first place to start, especially if you’re not comfortable using CSS to customize the embed form, is the General Form, which is what you’re seeing in the image above. To get to this page, after you create your email list you’ll be taken to a page that shows your list of subscribers (if you just created your list, no one will be there! ), and there will be a list of items you can select under your list name on that page. You’ll select Signup Forms and on the following page you’ll select General Form. Most people usually leave this page super basic, but you’ll want to make this page align with your brand. You can change the background color, upload your logo, and even input a little message that lets people know a little bit more about your email list and what they’ll be getting by signing up. If you have a lead magnet that you’ll send to them, this little text box is a great place to mention that! You’re almost there, friend! After you’ve completed the previous steps (plus maybe a few extras), you’re ready to send your first email campaign. To send a campaign, you’ll select Create Campaign on the dashboard. You may be asked what type of campaign you want to create, and I recommend just starting with a Regular Campaign. Once you’ve clicked through that, you’ll start going through the prompts to create your campaign. You’ll select the list of people you want to send your email to. Then you’ll name your email (for your eyes only) and set the subject line. You’ll then select a template and then move forward to the screen you see in the image above. You can easily begin to start adding your logo and text to the editor. This is such an easy platform to use. Wherever you want to add a new image or a different text box, you just click one of the boxes on the right and drag it over to the email on the left. Make sure you change the pre-header text at the very top of the email. I can’t tell you how many times I’ve received an email from someone and the text isn’t customized. This makes the email seem less professional. Make sure your links work, including any social buttons at the bottom of your email. A lot of people like to include the social follow buttons at the bottom. You want to make sure that those links are accurate – even I have sent an email with a messed up Twitter account, meaning anyone who clicked on that button went to someone else’s page. Yikes! Make sure you’re including your physical address. I know I’ve already mentioned this twice, but it is so important, y’all. You absolutely must have that address. No, just a city and state is not good enough. This is why I recommend that if you can, go out and get a PO Box that you can share instead of your home address. Once you’ve completed everything for your email, you can save that design as a Template so you can use the same design over and again on each email you send. I highly recommend you do this because it will save time and create a more branded experience for your subscribers. No one wants to sign up for someone’s email list and then feel like it’s a completely different person emailing them every time. And just like that, you’re done! 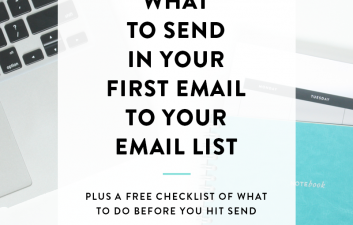 You’ve created + set up your email list and maybe even sent your first email campaign. 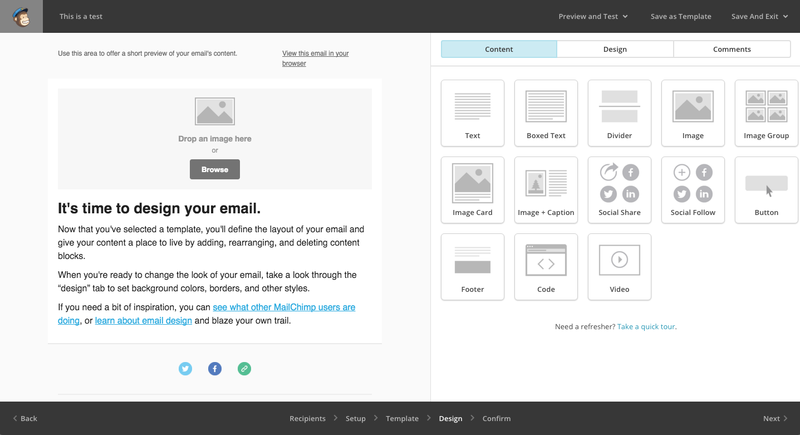 I highly recommend if you’re just now starting a list that you at least test out MailChimp. I’ve tried a few different EMPs and every single one has left me more confused than I’ve ever been with MailChimp. 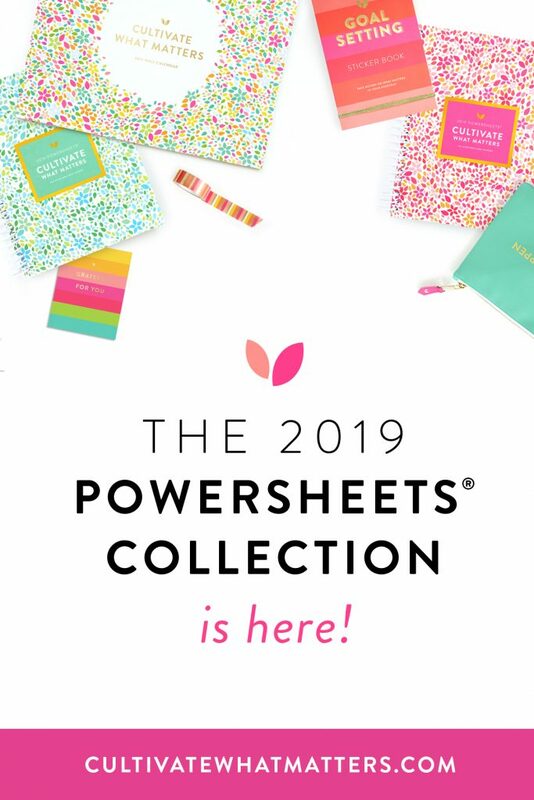 Looking for a little more advanced MailChimp training? 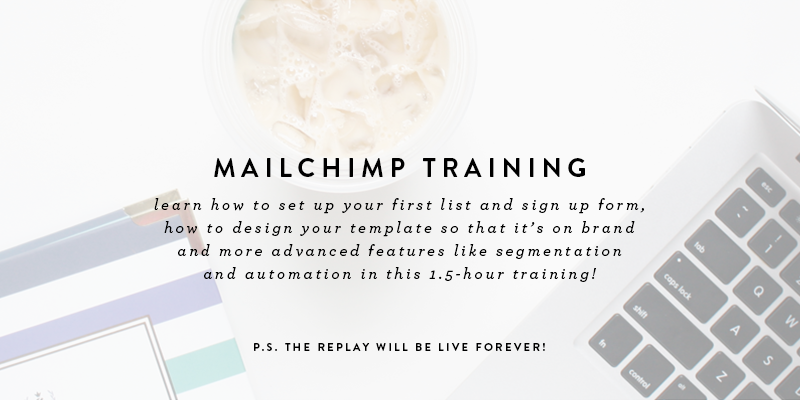 This Thursday I’m hosting a 1.5-hour long workshop to help you better understand a few more of the basics of MailChimp with both the free and paid versions of the platform. Even if you can’t make it, I highly recommend you join us because for this workshop? Well, the replay will live… forever. Yep, you heard me right. I can’t bear to think of people putting off creating a stronger relationship with their community simply because they can’t figure out the tech stuff. 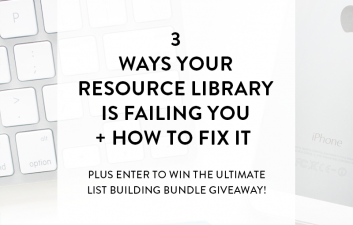 If you’re interested in signing up (dare I say you’d be crazy not to), you can hop right on over here (or the image above) and get your name on the list!